Turner Fisheries in Boston's Back Bay was my favorite table at the Taste of the South End, so I started to follow them on twitter shortly after that event and participated in a free lunch for two contest they had. I never really win anything, but I won! So Laura and I went for lunch on Thursday. The look of Turner reminds me of Legal Seafood a lot, especially the one in the theater district. It feels like your typical large seafood restaurant in a hotel. But with that said I thought it was really nice. And they had a little section where they had all the windows open so it almost felt like you were sitting outside, and you could people watch very nicely from here. I think that lunch is new here. They had a really nice lunch mention with a lot of different options, but where is the lobster bisque!? There are two soups I will always order if they are on the menu, french onion and lobster bisque and they did not have any here! We were torn at what we wanted to get, we went back and forth for awhile, but we decided on their "express lunch" where you pick a soup, an entree, and a dessert. I really love things like this! But part of me did really want a big salad with lobster or ahi tuna on it. 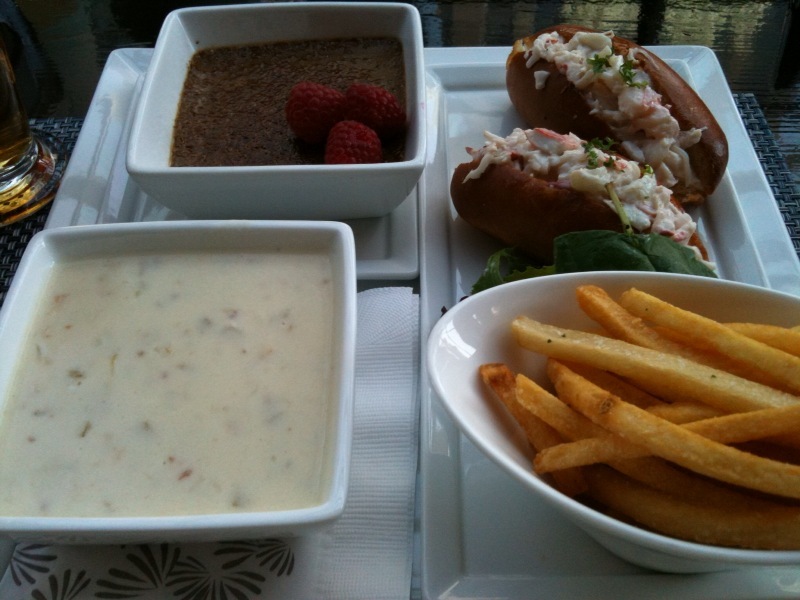 I chose chowder, lobster sliders (which came with fries) and creme brulee. I LOVED how this was presented! The chowder was really nice and creamy - the consistency I thought was just right. The lobster sliders were decent. I thought it was lacking something, but I am not sure what. Maybe just a little more flavor in the lobster meat - some mayo, or some lemon or something. But they were the perfect size for lunch and the fries were really crispy and good. My creme brulee was amazing. It had a great flavor to it and had three nice fresh berries on top! This is a perfect little platter for lunch. I would definitely come back here for lunch especially! But put some lobster bisque on the menu pleaseeeeee! So your tummy troubles were unrelated?